So you guys all voted in a landslide victory last week for a beer-related cake of some sort and I would hate to disappoint you. But let me just warn you. This recipe is evil. It’s easy to make given it’s crazy tallness and is, hands down, one of the richest things I’ve ever made. Trust me. That’s quite a statement. But seriously, packed into this delicious dark thing is a pound of butter, a pound of chocolate, a pint of cream, some sour cream, and almost two bottles of delicious oatmeal stout. This cake, you see, is for professional chocolate lovers only. 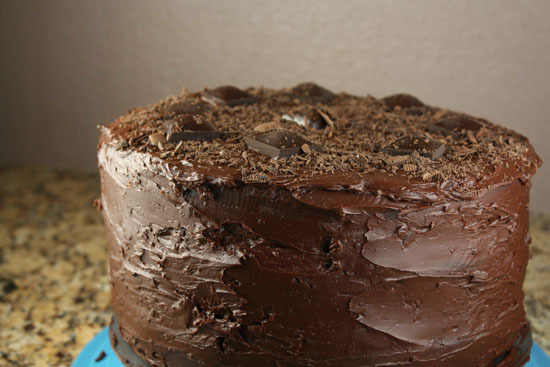 An incredibly rich cake with oatmeal stout, lots of chocolate, and a rich chocolate frosting. 2 Cups rich stout beer. I used an oatmeal stout. 1) For frosting, combine scream and chocolate in a saucepan over low-medium heat and cook, stirring constantly, until cream and chocolate is smoothly combined. Don’t boil the mixture, but it should be steaming hot. 2) Remove from heat and let cool in the fridge, stirring occasionally to keep it smooth, for 90-120 minutes. 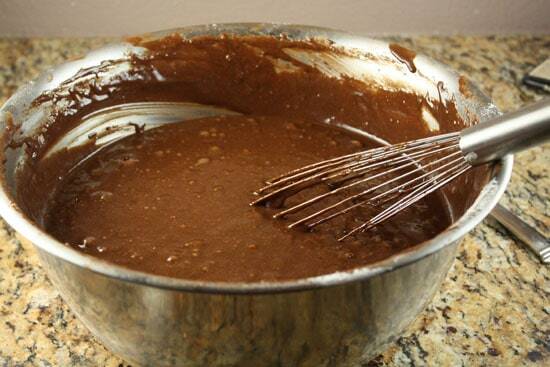 3) For cakes, combine stout and butter in a sauce pan and put over low-medium heat until butter is melted. 4) Then whisk in cocoa powder. It’s a lot of cocoa powder, so work slowly and make sure the mixture is nice and smooth. Remove from heat and let cool. 5) Whisk dry ingredients (sugar, flour, salt, baking soda) together. 6) Whisk eggs and sour cream in a large bowl. Once smooth, whisk in butter/stout/cocoa powder mixture. Again, whisk until smooth. 7) Whisk in dry ingredients in a few batches. Try not to overmix the batter, but make sure all the flour is incorporated. 8) Pour batter into three round cake tins that have been buttered and floured. 9) Bake for 30-35 minutes at 350 degrees. 10) Cool on a wire rack when the cakes are done. 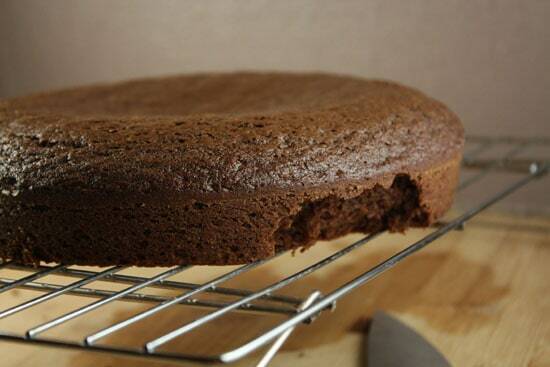 After a few minutes, remove cakes from tins and let cool completely. 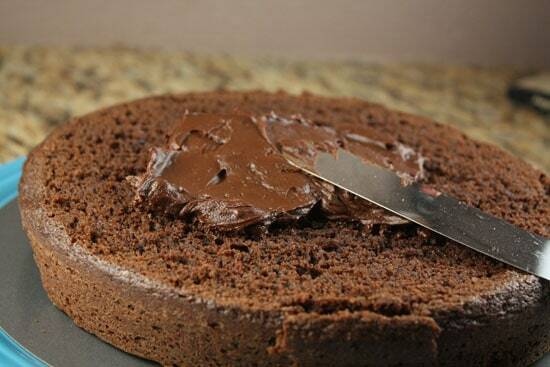 11) Use a large knife to slice off the tops of the cakes, making them level. 12) Stake cakes with 1/4 of frosting in between each layer, using the last 1/2 to frost the top and around the sides of the cake. 13) Shave on some fresh chocolate if you want or just serve it up! I was a bit skeptical of this frosting recipe. Only two ingredients? No powdered sugar? What’s the deal? Well, the deal is that it’s really easy to make and very rich. 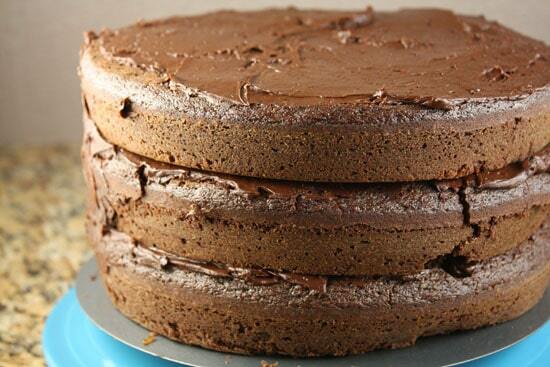 The end frosting is super-thick and is about as choco-packed as a frosting can be. 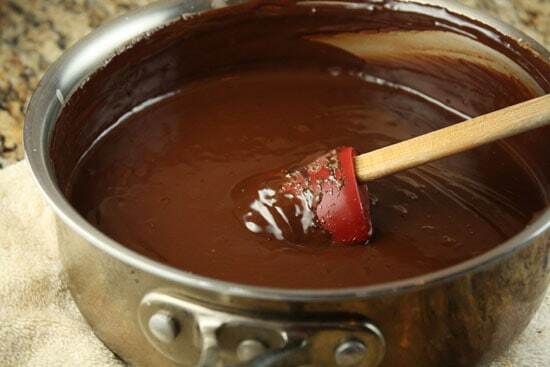 To make it, just add the cream and chocolate to a medium saucepan and put it over fairly low heat. 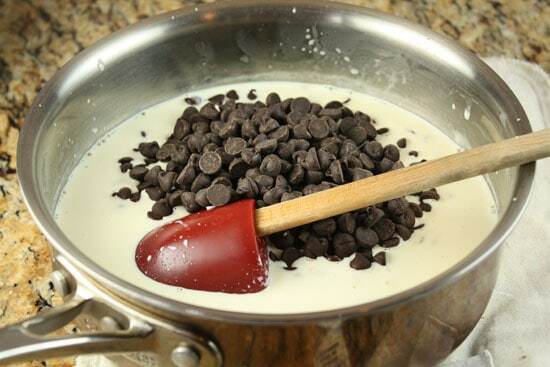 Cook this, stirring continuously, until the liquid is steaming (but definitely not boiling) and the cream and chocolate are completely incorporated in a nice smooth mix. Pour this into a bowl and move it to the fridge to chill out and harden slightly. It probably needs to chill for 90 minutes or so. Give it a stir every once in awhile just to keep it nice and smooth. If you’ve never made a layered cake before, have no fear. I’ve only made like two in my life and I was able to get it right (with one small mess-up). There’s only a few ingredients, but there are a lot of all of them! 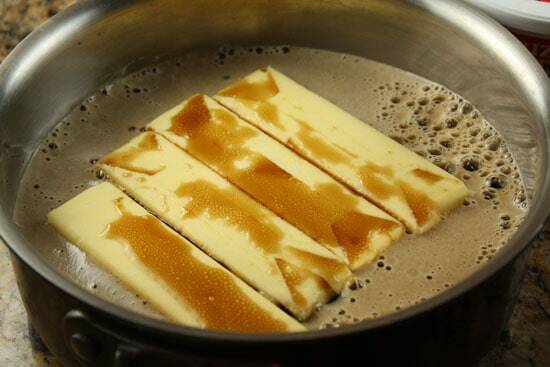 To start the batter, combine the stout and butter in a sauce pan over low heat. I realize this is a strange way to start a batter, but it works like a charm. So go with it. When the butter is melted whisk in all the cocoa powder until the mixture is smooth. It’ll be pretty thick because it’s a lot of cocoa powder. Once the cocoa powder is combined, turn off the heat to let it cool for a bit. Meanwhile, whisk together the dry ingredients in a bowl (flour, sugar, salt, baking soda) and the eggs and sour cream in a very large bowl. 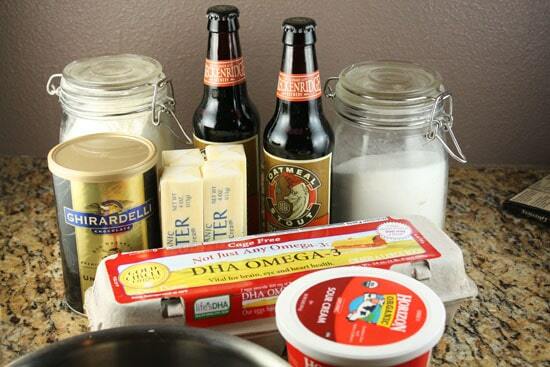 Once the sour cream and eggs are combined, slowly whisk in the warm chocolate stout mixture. Once that and the egg mixture is thoroughly combined, whisk in the flour in a few batches. Try not to over-mix the batter but make sure there’s no flour showing. This will be a thick and very rich batter. If you’re me, have a spoonful of it before you proceed. You need three round cake tins to make these cakes. I only have two so I had to re-use one which is fine. 1) Butter and flour the pans really well before you pour in the batter so the cakes don’t stick. 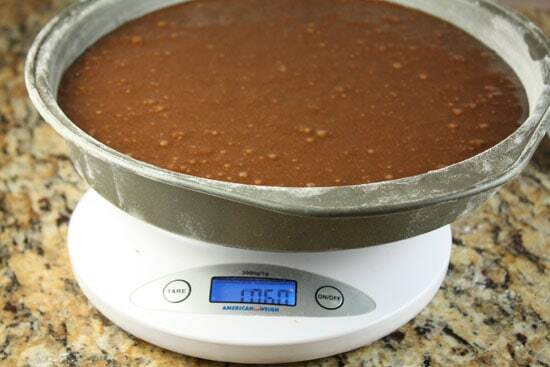 2) Weigh your batter with a scale if you can to make sure it’s evenly distributed. 3) Bake them at 350 degrees for 30-35 minutes. If you don’t have a scale, you can eyeball the cakes, but weighing the batter will ensure that each cake is the same. You’ll want to fill up the tins about 3/4 full. When the cakes come out of the oven, cool them on a wire rack if you have some and once the pan is cool enough to touch (5 minutes maybe), carefully remove the cake out of the tin. I did this by flipping the tin onto a plate. If you mess this up, it’s not a bit deal. Just do your best to get the cakes out cleanly. Using a butter knife to go around the edges really helps. The important thing about frosting layered cakes is to slice off the top of each cake to get them as level as possible. I use a serrated bread knife for this which works like a charm. The only other thing to remember about frosting the cakes is to make sure they are completely cool before frosting them. Once the cakes are level and cool, slap on about 1/4 of the frosting per layer and go to town. That leaves 1/2 of the frosting for the edges and top. The layers should stack pretty evenly and the frosting holds everything together. This is a pretty serious cake people. Finish the frosting by getting all the sides and top really well covered. As an added touch, I shaved some fresh chocolate and sprinkled it on top. I figured that would distract from my sub-par frosting job. This was by far the most decadent thing I’ve ever made. It was rich and moist and completely out of this world chocolatey. I don’t even like chocolate, but I couldn’t stop eating it. And seriously. It’s not that hard to make. 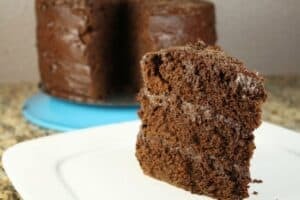 It’s a way easier cake recipe than some I’ve seen. If you want to seriously impress some people or just sabotage a few diets, this is the thing for you. Want to make it even richer? Try it with a peanut butter frosting. It is like a giant peanut butter cup, but better! This was one of the recipes for wedding cake I made for my wedding a couple months ago – it was definitely the most popular! And might I suggest making it with a chocolate stout? Seriously good. Good idea Caitlin. This would be a crazy wedding cake! What size cake tins, 8" or 9"? Looks wonderful! Love this website, I check it first thing every morning! 9 inch. Thanks for reading Gale! a Stout Cake — forget the wedding sounds like a Superbowl Cake to me……..but 4 sticks/1pound of butter. the frosting is actually a ganache. but that doesn't make it look any less awesome. Wow! What a cake! I am going to give this a whirl on Saturday, it looks absolutely delicious. Awesome tip about weighing the batter to make sure the cakes are even. I've never thought to do that. Thanks! This cake looks amazing. I think I'm gaining weight just by looking at it. oh my goodness!!! this looks divine – I am so trying it this weekend! So, I made this in a 9×13 pan last night. It needed to cook for nearly an hour before it was finished. I then poked holes into the cake with a straw and let the icing settle down into the cake and once it was all cooled, i put the rest of the icing on top. Everyone was please. This recipe rocked! Delicious and decadent…. And you were right about easy! The one thing I learned is that the ganache can easily be over-chilled. Quite the difference 15 min makes (going from a glossy chocolate, to a matte truffle consistency). Tastes amazing either way. God only knows why I am looking at desserts this late in the day. But I was looking at this recipe and it made me think of a recipe I read about last night. It is a Stout Ice Cream. My husband turned his nose up when I mentioned it. What do you think? Is that something that will work? Let me see if I can find the recipe online. Okay, It is in the May 2011 issue of Saveur on page 16.